We've produced an 8-part SCOFF videos series on seniors food knowledge, and we recently invited senior groups across the province to apply for funding from Food First NL, so they could host a community project or workshop that would improve food skills and knowledge, and therefore, food security for seniors in their area. SCOFF initiatives also aim to counteract the social isolation common among our senior population, by leveraging the power of food in bringing people and communities together. Below are summaries of 2 such events. 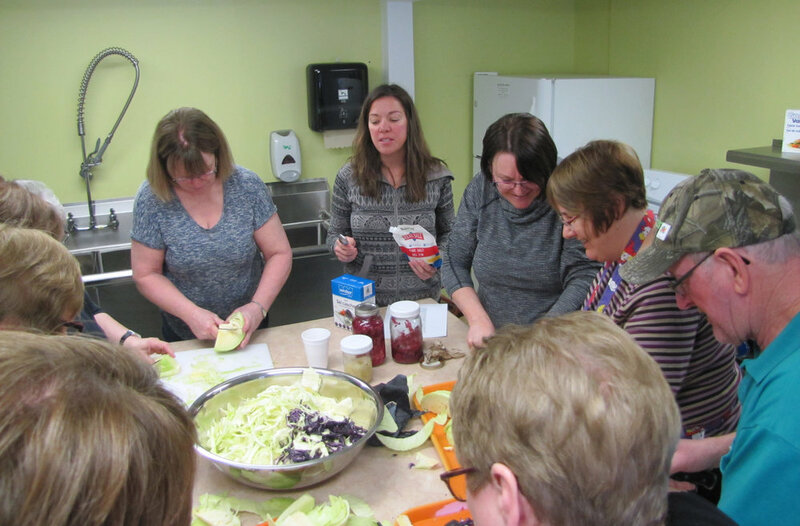 Fermentation is an alternative to traditional canning, so when members of this seniors group expressed interest in learning new methods of preserving foods, the idea of a hands-on fermenting workshop was set in motion. A volunteer from WEC led the hands-on demonstration, and began by highlighting the health benefits and history of fermenting foods. The group then made yogurt and fruit dip from milk, sauerkraut from red and green cabbage, and sourdough bread. The yogurt fruit dips and green cabbage sauerkraut emerged as the crowd favourites. Previous Humber Arm South 50+ Club workshops turned many members into backyard gardeners, so these greenthumbs now have the skills they need to lengthen the shelf life of their harvests, and get more out of the fruits (and vegetables) of their labour. Their fermenting skills will reduce their food wastage, and reliance on the availability of store-bought healthy food. The group also learned how to use electric yogurt makers. The information learned by workshop attendees was passed along to others in the community. The New World Island 50+ club hosted an event at the local Lion’s Club, where a series of presentations and demonstrations on locally produced food items informed the crowd on where they could source these goods from their own community, as opposed to relying exclusively on local stores. Thanks to the event, seniors are now aware of where they can get a variety of fresh local foods, from fish, berries, and produce, to quail and quail eggs, and breads made using locally milled, organic flour. There were even recipe suggestions provided for these items, and tips on how to preserve them, including demos on how to make jams from berries, or pickle quail eggs. The event also provided a workshop on growing herbs at home in the winter, and veggies in the backyard in warmer seasons. Everyone left with a heightened awareness of how to build and support a better food system, and better food security in their community. There was also a bartering table, where participants could trade a preserve for something they’d like to sample. The event was immediately applauded by the Central Health authority and covered by the local newspaper, The Pilot.